Safety insoles just for jikatabi! These insoles are made to fit into jikatabi and come in three sizes. With their molded shape and a stainless steel layer, they provide both stability and protection. They can be used to add extra cushioning or to give a more snug fit if your jikatabi are a bit on the loose side. The stainless steel is 0.5mm thick so they are flexible. The steel is coated with EVA rubber on both sides and has a polyester layer on the shoe side. 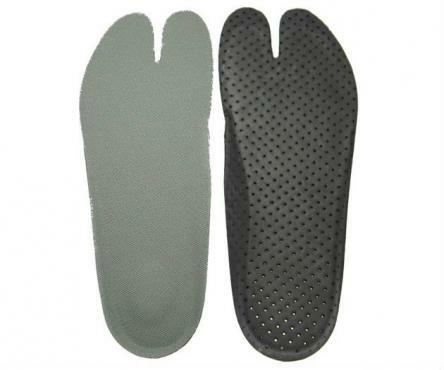 These insoles are made to fit into jikatabi and come in three sizes. With their molded shape and a stainless steel layer, they provide both stability and protection. They can be used to add extra cushioning or to give a more snug fit if your jikatabi are a bit on the loose side. They're also made to be antibacterial and odor-resistant.